For centuries real experts on the occult and the writings of Nostradamus all referred to the Editio Princeps or Originator of the Prophecies. 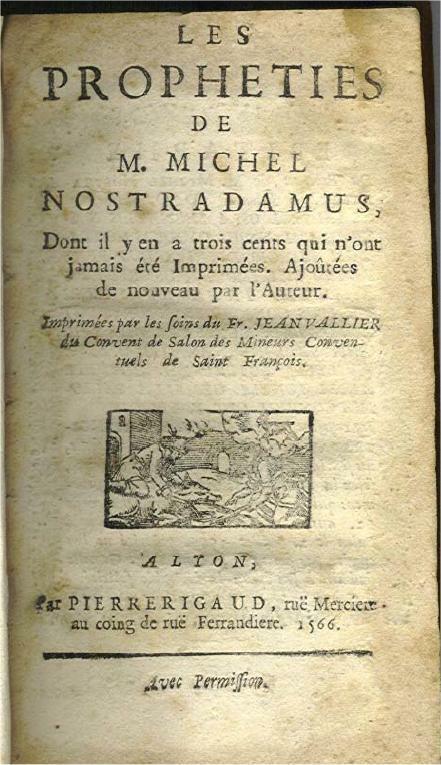 It was the 1566 Edition of Nostradamus printed by Pierre Rigaud. This edition was recently found the National Bavarian Library and it is also in a private collection of a modern seer who is so accurate in his own prophecies the media calls him THE NEW NOSTRADAMUS. Unlike other early editions of Nostradamus with 1566 on the work, these two surviving copies of the prophecies of Nostradamus have the correct amount of prophecies and are superior to other editions due to the spelling of words and typesetting. While modern commentators of Nostradamus refuse to believe that Pierre Rigaud could have printed this edition in 1566, they fail to realize that either a relative of Benoist Rigaud named Pierre printed alongside him in the middle 16th Century or his son around 1600 simply inscribed the year 1566 on his work in 1600 to honor the death of Nostradamus. What is clear from analysis of the 1566 Edition is how superior to other early editions it is in how the spelling is different and it shows extreme care was taken with the text compared to other early editions. The name Friar Jean Vallier appears on this Edition as a supervisor of the text and publication. Fr. Vallier was in fact from a monastery in Salon that was directly mentioned by Nostradamus in his will. While some modern commentators refuse to believe such a person existed we have proof a Jean Vallier existed in the early 17th Century in Salon. While we cannot yet say for sure if a Pierre Rigaud printed in the middle 16th Century and if Jean Vallier was a Friar then, we know both Pierre and a Jean Vallier did exist by the early 17th Century in Salon. As to other early editions of Nostradamus, the 1555 is most likely an authorized edition since it has the proper mixture of Roman and Arabic numerals of the 1566 Edition, something we believe Nostradamus mandated to his real printers to do to protect them from early book pirates. Other early editions such as the 1557 Rosne and the obvious 1568 Benoist Rigaud FORGERY also do not have the proper mix of both Roman and Arabic numerals on the Quatrains. Most of the early editions of Nostradamus Prophecies that survive today are from post 1605 when quatrains were added to the original 942 prophecies of Nostradamus that we believe are authentic. The superior text of the 1566 Edition is clear to anyone who analyzes it. It is a true treasure in the study of Nostradamus writings. Occult authors for years have referenced THIS BOOK the 1566 Edition Princeps and once again IT IS HERE FOR THE WORLD TO SEE and it is superior to the 1568 Benoist Rigaud edition which most likely was printed after this edition was made by Pierre.